You may have already shown the children how much fun baking soda and vinegar volcanoes can be, but there are plenty of other things you can do with those ingredients too. In this activity, kids can fill up balloons not by pumping or blowing, but by taking advantage of the chemical reaction made by mixing baking soda and vinegar. 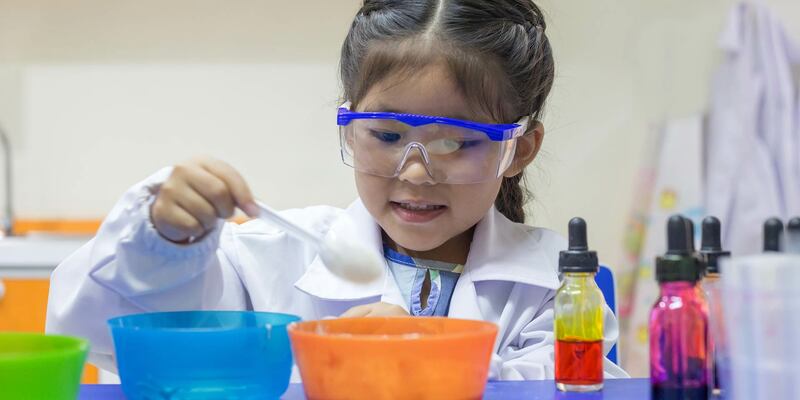 Before you get started though, this activity can get a little wet and messy, so you may want to do it outside, or at least have the little scientists cover up in a smock or kid’s bath robe. A balloon for each child (hint: inflate and deflate them beforehand, so they stretch easily). Help each child pour vinegar into their bottle until it is about one quarter full. Next, use the funnel to help each child pour a teaspoon of baking soda into the balloon, then wrap the balloon’s opening over the mouth of the bottle – just be careful to keep the rest of the balloon upside down or sideways, so you do not pour the baking soda into the vinegar – this will be the kid’s job. Now, all that the preschoolers need to do is flip the balloon upside down so the baking soda pours out. Almost right away, the vinegar and baking soda should fizz up and start inflating the balloon. Once the balloon has stopped inflating, you can take it off and tie it up for the kids to play with. Unlike helium balloons, these won’t float. In fact, because they are filled with carbon dioxide, which is a fairly heavy gas, they won’t even fall slowly like a balloon blown up with air; instead, they will just drop. Kids have a great time playing with their very unique balloons and they’ll have something cool to take home. This activity is a fantastic way to teach two lessons at once: how absorption works and what happens when you mix certain colors. To get started, give each child a paper towel. Then, they can dip the bottom edge of it into a cup of water colored with food coloring for 10 seconds. They should be able to see the towel getting wet and changing color, even where it isn’t in contact with the water. They can see just how powerful this is if you roll up a paper towel and put one end in a cup filled up with water and food coloring, and the other end in an empty cup. If you check back in an hour, the two cups should have about the same amount of water since it traveled along the paper towel, out of the full cup and into the empty one. As a grand finale, fill up one clear cup with water and yellow food coloring, and another clear cup with water and blue food coloring. In between them, place an empty, clear cup. Roll up two paper towels. Hang one towel in the blue liquid, an end of the second towel in the yellow liquid, and the other end of each towel in the empty cup. After about an hour, the middle cup should be filled with green liquid from the blue and yellow liquids combining, even though no one poured the two cups together! This activity can be a great tie in with a lesson on dinosaurs. It is also fantastic for kids, because they can add their own creative touches to the project. All you need is salt dough, a few rolling pins, and some things to “fossilize”. You can fossilize almost anything that is able to make an imprint on the soft salt dough. If there is an oven on site, the dough can be baked at 250 degrees for 2-1/2 hours, or if not, you can send home instructions to the parents on how to bake it. Once it has been removed from the oven and cools off, they’ll have their very own fossil molds. Kids learn best from hands-on activities. Whether you’re helping preschoolers create fossils or filling up balloons (without anyone blowing on them), there are plenty of ways to keep them engaged, excited and learning!